SuperPhillip Central's first review of the month is one that happens early this month instead of midway through like November. It's of the retro variety, and it's for a fun genre that I really enjoy, the kart racer. 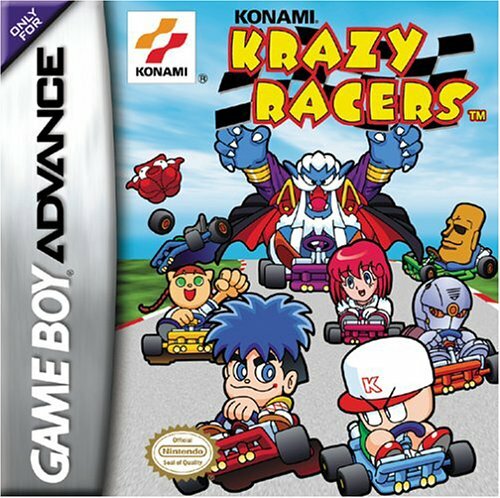 It's Konami Krazy Racers, and I thank goodness that the developers didn't call the game Konami Krazy Kart for acronym reasons. So krazy of a kart racer that Konami needed to spell it with a "K"
Kart racers are my preferred racing experience. I love the arcade nature of it with goofy characters, crazy power-ups and items, and fantastical tracks to race on. 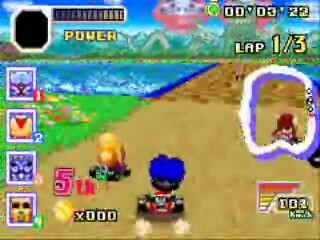 I missed out on a notable kart racer at the Game Boy Advance's launch back in 2001, Konami Krazy Racers. Not only is it a competent kart racer, but it is also a nice look back at when Konami was still running on a cylinders as a gaming company and not the loathed-by-many one it is today. 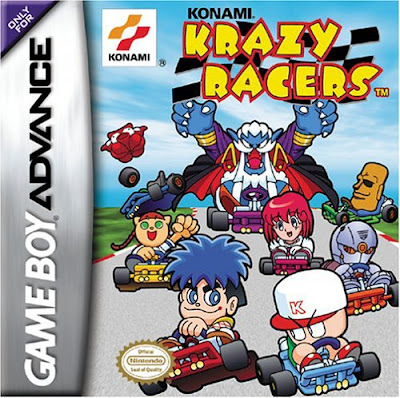 As the title suggests, Konami Krazy Racers features an assortment of characters from Konami's various franchises. For instance, there is Goemon from the Legend of the Mystical Ninja franchise, Gray Fox from Metal Gear Solid, Dracula from Castlevania, and even Power Pro-kun from the MLB Power Pros series. The total number of characters in the game is 12 with four of those being unlockable through acquiring hidden diamonds on three of the races, and one unlocked through time trials on two of the game's tracks. Each character has its own attributes such as top speed, acceleration, and weight to consider when choosing a character that fits best with a given player's play style. Along with the Konami characters that are featured in the game, the tracks also have a Konami theme too. There are tracks that take place in Dracula's Magma Castle, tracks that are full of Metal Gear Solid cardboard boxes to dodge, an MLB Power Pros-based track that has players driving around a large baseball diamond, and much more. The tracks consist of many twists and turns, jumps, hazards, and obstacles to avoid if you want to claim the first place prize. Take flight with these oncoming jump pads. 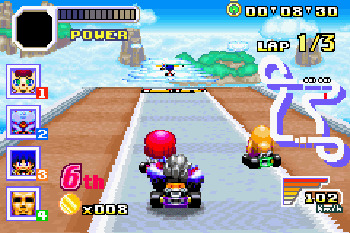 Konami Krazy Racers plays really similarly to the original Super Mario Kart as well as the Game Boy Advance's own Mario Kart: Super Circuit. 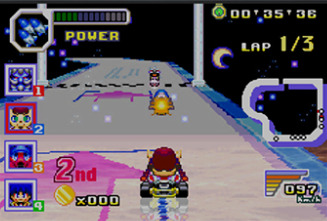 Mode 7 graphics are used to simulate three-dimensional racing, and this looks really good for an early GBA title, sporting a draw distance that allows you to prepare for oncoming obstacles, hazards and turns, as well as neat effects like reflections of racers and items on reflective surfaces of track. The reflection of racers on the track is a nice touch. 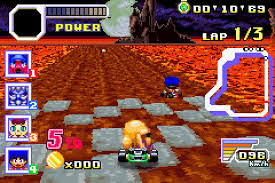 The controls are also quite similar to the games that inspired Konami Krazy Racers with a button to accelerate, brake and reverse, bunny hop to leap over small chasms and to help with turning, as well as an item button. Controls are tight and feel excellently done. You never really feel that you're about to lose control, or at least when you make a driving error, it's your own mistake and not that of the game's. Seventh place? This racer better make a squeeze play! Any kooky kart racing game needs a steady supply of items to keep itself feeling interesting and fresh. Konami Krazy Racers has these, such as blue missiles that fire thrice in the direction the user is facing, a barrier that protects the user against items used by others, and a scooper drill that drills a hole in the ground, making anyone who passes over it fall into it. These item archetypes are again similar to what is found in Mario Kart, but if the kart isn't broke, why fix it? There are four cups of four tracks each in Konami Krazy Racers. Progression is done by competing in a cup, getting first place, and then unlocking and passing a license test in order to unlock more cups and races. License tests consist of a variety of up to four challenges that need to be cleared in order to pass the test. Players start at the C class, and through completing tests after finishing up cups, they move on to B class, A class, and S class tests respectively. Such trials include beating the time of a given track, winning a one-on-one race with an AI opponent, or the occasional odd race-the-track backwards to beat a time while avoiding the other seven racers driving the opposite direction. Dracula's castle can be viewed in the distance, set against a full moon. 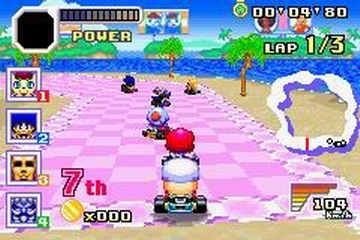 There aren't multiple difficulties of races that need to be completed in Konami Krazy Racers like there are in the Mario Kart series. Instead, players can just pick the difficulty they'd like and stick with it throughout the game. This makes the process of clearing cups and passing license tests a short one. Sure, there are four hidden characters to unlock as touched on before, and there is a battle mode that pits players against three AI opponents, something that Mario Kart: Super Circuit lacks. However, doing everything there is in Konami Krazy Racers is not a long process, so unless you wish to just do races for the joy of it, there isn't much to the game to keep you playing for a lengthy time. Konami Krazy Racers is a successful kart racer because it's a blast to play, doesn't suffer from too much in the way of a rubber-band AI, and has a colorful assortment to fun tracks to race on. The excitement might end prematurely, but if you're a fan of kooky kart racers, then Konami Krazy Racers is a solid one to go krazy over.